Is efficient-market theory becoming more efficient? BUILD a better mousetrap, the saying goes, and the world will beat a path to your door. Find a way to beat the stockmarket and they will construct a high-speed railway. As investors try to achieve this goal, they draw on the work of academics. But in doing so, they are both changing the markets and the way academics understand them. The idea that financial markets are “efficient” became widespread among academics in the 1960s and 1970s. The hypothesis stated that all information relevant to an asset’s value would instantly be reflected in the price; little point, therefore, in trading on the basis of such data. What would move the price would be future information (news) which, by definition, could not be known in advance. Share prices would follow a “random walk”. Indeed, a book called “A Random Walk Down Wall Street” became a bestseller. The idea helped inspire the creation of index-trackers—funds that simply buy all the shares in a benchmark like the S&P 500. From small beginnings in the 1970s, trackers have been steadily gaining market share. They command around 20% of all assets under management today. But the efficient-market hypothesis has repeatedly been challenged. When the American stockmarket fell by 23% in a single day in October 1987, it was hard to find a reason why investors should have changed their assumptions so rapidly and substantially about the fair value of equities. Robert Shiller of Yale won a Nobel prize in economics for work showing that the overall stockmarket was far more volatile than it should be if traders were adequately forecasting the fundamental data: the cashflows received by investors. Another example of theory and practice parting company is in the foreign-exchange market. When Sushil Wadhwani left a hedge fund to join the Bank of England’s monetary policy committee (MPC) in 1999, he was taken aback by the way the bank forecast currency movements. The bank relied on a theory called “uncovered-interest parity”, which states that the interest-rate differential between two countries reflects the expected change in exchange rates. In effect, this meant that the forward rate in the currency market was the best predictor of exchange-rate movements. Mr Wadhwani was surprised by this approach, since he knew many people who used the “carry trade”, ie, borrowing money in a low-yielding currency and investing in a higher-yielding one. If the bank was right, such a trade should be unprofitable. After some debate, the bank agreed on a classic British compromise: it forecast the currency would move half the distance implied by forward rates. Many who work in finance still believe they can beat the market. After all, there was a potential flaw at the heart of the efficient-market theory. For information to be reflected in prices, there had to be trading. But why would people trade if their efforts were doomed to be unprofitable? One notion, says Antti Ilmanen, a former academic who now works for AQR, a fund-management company, is that markets are “efficiently inefficient”. In other words, the average Joe has no hope of beating the market. But if you devote enough capital and computer power to the effort, you can succeed. That helps explain the rise of the quantitative investors, or “quants”, who attempt to exploit anomalies—quirks that cannot be explained by the efficient-market hypothesis. One example is the momentum effect: shares that have outperformed the market in the recent past continue to do so. Another is the “low-volatility” effect: shares that move less violently than the market produce better risk-adjusted returns than theory predicts. A new breed of funds, known in the jargon as “smart beta”, have emerged to exploit these anomalies. In a sense these funds are simply trying to mimic, in a systematic way, the methods used by traditional fund managers who interview executives and pore over balance-sheets in an attempt to pick outperforming stocks. Whether these funds will prosper depends on why the anomalies have been profitable in the past. There are three possibilities. The first is that the anomalies are statistical quirks; interrogate the data for long enough and you may find that stocks outperform on wet Mondays in April. That does not mean they will continue to do so. The second possibility is that the excess returns are compensation for risk. Smaller companies can deliver outsize returns but their shares are less liquid, and thus more difficult to sell when you need to; the firms are also more likely to go bust. Two academics, Eugene Fama and Kenneth French, have argued that most anomalies can be explained by three factors: a company’s size; its price relative to its assets (the value effect); and its volatility. The third possibility is that the returns reflect some quirk of behaviour. The outsize returns of momentum stocks may have been because investors were slow to realise that a company’s fortunes had improved. But behaviour can change; Mr Wadhwani says share prices are moving more on the day of earnings announcements, relative to subsequent days, than they were 20 years ago. In other words, investors are reacting faster. The carry trade is also less profitable than it used to be. Mr Ilmanen says it is likely that returns from smart-beta factors will be lower, now that the strategies are more popular. 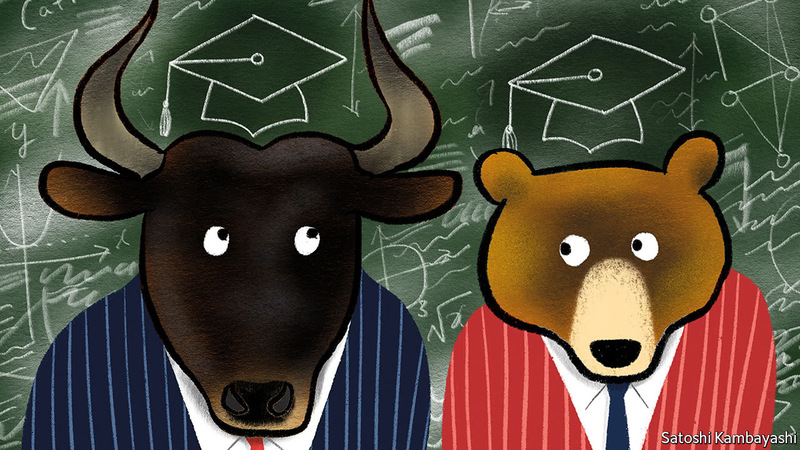 If markets are changing, so too are the academics who study them. Many modern research papers focus on anomalies or on behavioural quirks that might cause investors to make apparently irrational decisions. The adaptive-markets hypothesis, devised by Andrew Lo of the Massachusetts Institute of Technology, suggests that the market develops in a manner akin to evolution. Traders and fund managers pursue strategies they believe will be profitable; those that are successful keep going; those that lose money, drop out. The results can be dramatic. In August 2007 there was a “quant quake” as computerised strategies briefly stopped working; the suspicion was that one manager was offloading his positions after taking losses in the mortgage market. The episode hinted at a danger of the quant approach: if computers are all churning over the same data, they may be buying the same shares. 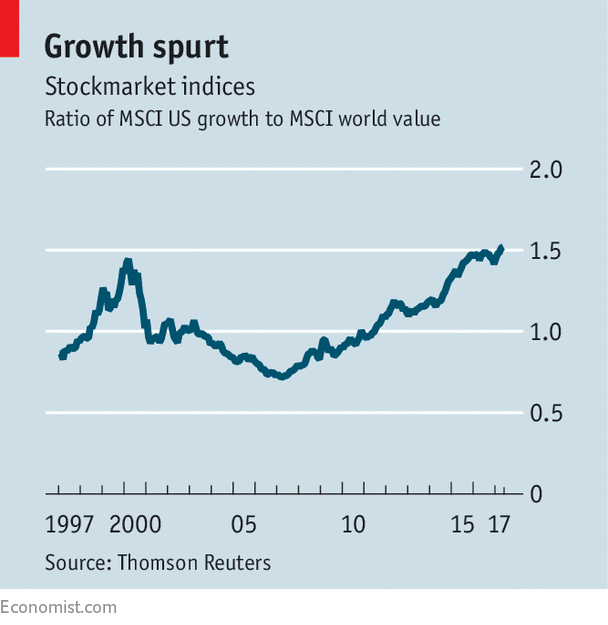 At the moment American growth stocks, such as technology companies, are as expensive, relative to global value stocks, as they were during the dotcom bubble (see chart). What if the trend changes? No mathematical formula, however clever, can find a buyer for a trader’s positions when everyone is panicking. It was a love affair — platonic, but a love affair, all the same. As a former US diplomat put it, President Ronald Reagan and Margaret Thatcher were “political and philosophical soul mates”. The connection between Reagan and Thatcher secured the return of the ideal of the free market. Both aimed at rolling back what they thought an over-intrusive and incompetent state. Their marriage of ideas did not just reshape the politics and policies of their countries. It reshaped those of the world. But it did not do so, on its own. Arguably, Deng Xiaoping’s rise to power in China was a more fundamental long-run shift. Fast forward to today. In his inaugural address in January, Donald Trump spoke not of Reagan’s “shining ‘city on a hill’”, but of “American carnage”. This was more than a change of mood. The leaders of the Republican party had long sought the votes they needed for their primary goals of tax cuts, spending cuts and economic deregulation by appealing to cultural, religious and ethnic anxieties. Mr Trump spoke directly to the angry and anxious, by promising to defend social security and Medicare, embrace protectionism and curb immigration. He said: “Protection will lead to great prosperity and strength.” This was neither traditional conservatism nor Reaganism. It was rightwing populism. Mr Trump is not as different from Reagan as Mrs May is from Thatcher. He has ended up with “pluto-populism” — policies that benefit plutocrats, justified by populist rhetoric. As his budget proposals show, the aim is still to slash taxes on the rich, at the expense of the poor. But Mrs May has returned to the interventionism of Harold Macmillan, prime minister from 1957 to 1963. When the classical liberal Friedrich von Hayek (one of Thatcher’s intellectual heroes) dedicated The Road to Serfdom, published in 1944, to “socialists of all parties”, he had such people in mind. What explains these journeys to different destinations? Confidence in the benefits of free markets, free trade and free movement of people has been lost in both countries. Conservative thinking has become more tribal, less global. The devastation caused by the financial crisis of 2007-09 is one explanation. Hostility to immigration is another. Without the latter, Hillary Clinton would probably be president of the US and David Cameron would be prime minister of the UK. The traditions have returned to different roots: the hierarchical paternalism of English conservatism; the Jacksonian populism of the US. Not only are the US and the UK in different ideological places, but no large country promotes the optimistic and outward-looking faith in free markets of the Reagan and Thatcher era. The closest to being such advocates today are Angela Merkel’s Germany and Xi Jinping’s China. The US and UK have moved into a period marked by suspicion of foreigners and doubts about free markets, particularly if foreigners are involved in any way. It seems highly likely that this shift will last beyond the personalities now involved. The result is likely to be a different ideological centre of gravity for policy, at least in the west. As fundamental is asking whether the policies being promoted will assuage the anxiety of those who brought Mr Trump and Mrs May to power (if indirectly, in the latter’s case). Alas the opposite is far more likely. Both seem to like the idea of tinkering in markets on a discretionary basis. No reason exists to expect such interventions in the market to achieve much. In Mr Trump’s case, the proposed slashing of federal spending on areas essential to the disadvantaged, to the quality of essential public services and to the provision of public goods is likely to be highly damaging to the welfare of many of his supporters. Meanwhile, nothing he does will bring back lost manufacturing and mining jobs. This failure seems sure to make the base angrier. Meanwhile, the painful reality of Brexit will overwhelm Mrs May’s new Conservative agenda even if it could be made to work in its own terms, which is unlikely. Yet the changes in American and British conservatism are also significant. What they are saying is that a transformation in policy and politics is demanded. That surely reflects what has gone wrong in western societies over the past four decades. Some of the adverse changes were inevitable and desirable: the monopoly of western countries over advanced economic know-how could not be sustained; and the ageing of their societies was similarly desirable and inevitable. The economic forces driving greater inequality were also very powerful. Nonetheless, big errors were made, not least in letting the financial sector become so dominant. The evidence also demonstrates inequality is a choice, not a destiny. It is time for re-thinking along many dimensions. Part of it must be about the role and limits of markets. Part of it must be about managing immigration in ways that allow (almost) everybody to feel they benefit. A part must be about managing the complex interplay between global markets and national democratic politics. But perhaps the most important part of all will be about rethinking the role of states, acting individually and together. It is a legitimate criticism of the Reagan and Thatcher revolutions that they underestimated the enduring functions of states as insurers, as protectors, as funders of education and health, as providers of infrastructure, as suppliers of public goods, as managers of externalities, as regulators of monopolies, as stabilisers of economies, as redistributors of incomes and not least as the focus of political loyalties. Moreover, to achieve what is needed at home, states also have to co-operate — always a hard task. Getting all this right will be difficult. It would be a good thing if the British and Americans recognised that they do not possess all (perhaps even most) of the answers. They might even learn from others. One encouraging thing about Emmanuel Macron, the French president, is that he has noted this for his own country, pointing to the Scandinavian example of dynamic economies with high levels of social protection. If political traditions are to be renewed, it must be done by being open to ideas from others. The Anglo-Americans should dare to follow Mr Macron’s suit. As the central bank cuts its holdings, it could still manipulate yields by deciding which maturities to hold. How will the world’s largest bond portfolio be managed? Minutes of the May Federal Open Market Committee released this week provide hints. While most Fed watchers offered guesses about the size and timing of the unwinding of the central bank’s $4.5 trillion balance sheet, the composition of the System Open Market Account generated scant discussion. Letting securities simply mature as they come due is functionally equivalent as the Fed selling them outright. Since the Fed wouldn’t be reinvesting in the new Treasury or agency security, the public would have to pony up for the new issues. All else being equal, the increased supply of new securities means lower prices and higher yields. 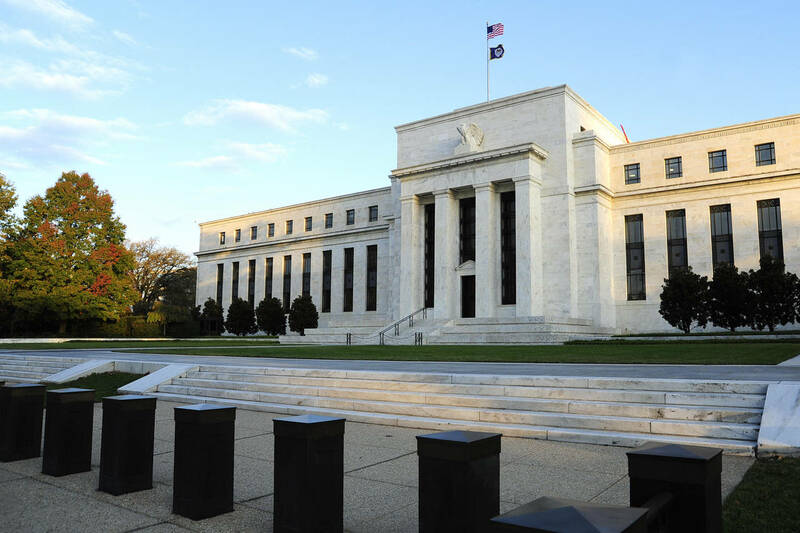 The purchase of $600 billion of securities during the Fed’s “quantitative easing” program had the effect of about a 75-basis-point cut in the fed funds rate, according to a Fed estimate cited by Morgan Stanley. So, a $300 billion reduction in the Fed’s portfolio over four quarters would be functionally equivalent to about a 35-basis-point hike in the funds rate, the bank said in a research note. The FOMC minutes discussed a system of “caps” in the volume on the dollar amount of Treasury or agency securities that would be allowed to run off each month. That cap would start and low levels and be adjusted every three months, according to proposed scheme. Morgan Stanley’s team hypothesized the Fed could start shrinking its balance sheet in the fourth quarter, with redemptions of $5 billion each month in Treasuries and agency mortgage-backed securities. In each successive quarter, those caps would be increased by $5 billion apiece, to $10 billion in the first quarter of 2018, $15 billion in the second quarter and $20 billion in the third quarter. Beyond the Fedspeak, let’s speculate how things could unfold. JP Morgan PM in Your Value Your Change Short position economists postulate the Fed could begin by capping Treasury redemptions at $8 billion a month and agency MBS at just $4 billion, so the Fed reduces its mortgage holdings more gradually. In other words, the composition of the Fed’s redemptions isn’t set in stone. By extension, neither are the securities buys when it does reinvest. The Fed has a history of trying to manipulate the yield curve by adjusting its holdings. In QE2, the second phase of its quantitative easing in 2011, the Fed swapped shorter-dated securities for lengthier maturities. The aim was to bring down longer-term interest rates to help boost housing. What if the Fed decided it wanted a more steeply sloped yield curve? That would be helpful to banks by boosting their net interest margins and likely encourage lending. It will be interesting to see how the Fed shrinks its portfolio, a process that will stretch out well into the next decade. And how that interacts with the administration’s spending and borrowing plans may be even more interesting. In any case, the Fed has been anything but a passive observer since the financial crisis. Even as it unwinds its post-crisis policies, it will be an active participant in the market. NEW HAVEN – For the past seven years, I have taught a popular class at Yale, called “The Next China.” From the start, the focus has been on the transitional imperatives of the modern Chinese economy – namely, the shift from a long-successful producer model to one driven increasingly by household consumption. Considerable attention is devoted to the risks and opportunities of this rebalancing – and to the related consequences for sustainable Chinese development and the broader global economy. While many of the key building blocks of China’s transitional framework have fallen into place – especially rapid growth in services and accelerated urbanization – there can be no mistaking a new and important twist: China now appears to be changing from an adapter to a driver of globalization. In effect, the Next China is upping the ante on its connection to an increasingly integrated world – and creating a new set of risks and opportunities along the way. The handwriting has been on the wall for several years. This strategic shift is very much a reflection of the leadership imprint of President Xi Jinping – in particular, his focus on the “China Dream.” Initially, the dream was something of a nationalist mantra, framed as a rejuvenation by which China would recapture its former position of global prominence, commensurate with its status as the world’s second largest economy. But now the China Dream is taking shape as a concrete plan of action, centered on China’s One Belt, One Road (OBOR) plan. This ambitious pan-regional infrastructure initiative combines economic assistance with geostrategic power projection, supported by a new set of China-centric financial institutions – the Asian Infrastructure Investment Bank (AIIB), the New (BRICS) Development Bank, and the Silk Road Fund. For those of us studying China’s economic transformation, this is hardly a trivial development. While the shift remains a work in progress, I would stress three tentative implications. First, China has not made a full about-face. As an economist, I am prone to placing too much emphasis on models and on the related presumption that policymakers can flip the switch from one model to another. Yet it is not that black and white – for China or for any other country. China’s leaders have, for all practical purposes, now conceded that a consumer-led growth strategy is tougher to pull off than originally thought. The consumption share of GDP has risen just 2.5 percentage points since 2010 – far short of the boost to personal incomes that might be expected from the 7.5-percentage-point increase in the share of services and a 7.3-percentage-point increase in the high-wage urban share of its population over the same period. This disconnect largely reflects a porous social safety net that continues to foster high levels of fear-driven precautionary saving, which is inhibiting the growth of discretionary consumption. While still committed to urbanization and services development, China has elected to draw on a new external source of growth to compensate for a shortfall of internal demand. Second, this global push has many of the features of the old producer model. It enables an increasingly worrisome overhang of domestic excess capacity to be directed at OBOR’s infrastructure requirements. And it relies on state-owned enterprises (SOEs) to drive that investment, forestalling long-needed reforms in this bloated segment of Chinese industry. The flip side of this newfound support for the producer model has been a de-prioritization of consumer-led growth. In Prime Minister Li Keqiang’s annual Work Report – the official statement of economic policy – emphasis on the consumer-led structural transformation has been downgraded in each of the last two years (ranked third in both 2016 and 2017, as so-called supply-side initiatives have gained higher priority). Third, China’s new global approach reflects a recasting of governance. Xi’s consolidation of domestic power is only part of the story. The shift in economic decision-making away from the State Council’s National Development and Reform Commission (NDRC) toward Party-based Leading Small Groups is particularly important, as are the anti-corruption campaign, heightened Internet censorship, and new regulations on non-governmental organizations (NGOs). The irony of such power centralization is unmistakable. After all, Xi issued early promises to break up deeply entrenched power blocs, and the Third Plenum reforms of November 2013 emphasized the promotion of a more decisive role for markets. But there is an even deeper irony for China’s new global push. It runs against the grain of a populist anti-globalization backlash that is brewing in many developed countries. As a producer-focused economy, China has long been the greatest beneficiary of globalization – both in terms of export-led growth and poverty reduction stemming from the absorption of surplus labor. That approach has now been stymied by China’s mounting internal imbalances, a post-crisis slowdown in global trade, and an increase in China-focused protectionism. As a result, China’s new attempts to gain increased leverage from globalization are not without serious challenges of their own. A more global China also has important ramifications for Chinese foreign policy. Territorial disputes in the South China Sea loom particularly large, but China’s footprints in Africa and Latin America are also drawing heightened scrutiny. This new strategy raises perhaps the biggest issue of all – whether China fills a hegemonic void created by the isolationist “America first” approach of US President Donald Trump. In short, the Next China is shaping up to be more outwardly focused, more assertive, and more power-centric than I envisioned when I started teaching this course in 2010. At the same time, there appears to be less commitment to a market-based reform agenda featuring private consumption and SOE restructuring. The jury is out on whether this changes the final destination of Chinese rebalancing. I hope that is not the case. But that is what makes it more interesting to teach an applied course, where the focus is always a moving target. Today’s labour-market report will be the last before the Federal Reserve meets in mid-June. This year payrolls have grown by an average of 185,000 a month, helping to bring the unemployment rate down to 4.4%. Economic growth, which was a plodding 1.2% at last count, will probably surge in the second quarter. The Fed is worried that the job market might overheat, sparking inflation, yet there is scant evidence of that happening yet. In fact, core inflation, which excludes food and energy prices, fell to 1.5% in April, according to the Fed’s preferred measure. Nonetheless, markets put the chances of a rate rise at more than 90%. The central bank may also commit to shrinking its balance-sheet, which grew substantially after the financial crisis. A bumper jobs report would make tighter monetary policy a near-certainty. Whether it would portend higher inflation is a tougher question.